Coordonnateurs : Belmans R., Binns K.J., Geysen W., Vandenput A. Introductory Lecture.- 1. Dynamic Behaviour and Oscillating Problems in Synchronous Generators with a Superconducting Field-Winding.- 2. Some Methods for the Reduction of Electromagnetically Excited Vibrations and Noise in Induction Machines Due to the Slot Openings.- 3. Torsional Vibration in the Rotor of a Superconducting Turbogenerator.- 4. Torsional Vibrations of Superconducting Generators.- 5. Electromagnetic Influence on the Radial Vibrations of Two-Pole Induction Motors.- 6. Design of Foundations for Alternating Current Machines with Respect to the Dynamic Effects: Experimental and Mathematical Analyses.- 7. The Active Magnetic Bearing Enables Optimum Control of Machine Vibrations.- 8. Analysis of Effect Damper Circuit Modelling and the Fault Clearing Process Has on Amplitude and Decay of Torsional Vibrations in Turbine-Generator Shafts Following Severe Disturbances on the Grid Supply.- 9. Transients of Induction Machines in Driving Systems.- 10. Measurement of Induction Motor Torque Pulsations Due to Inverter Supply.- 11. Determination of the No-Load Currents and the Associated Winding and Iron-Core Forces of Saturable Induction Machines for Sinusoidal and Nonsinusoidal Terminal Voltages.- 12. General Torsional Fatigue of Turbogroup Shafts Due to Electrical Disturbances — Part I: Electromechanical System: Modelisation — Computation of Torsional Stress.- 13. General Torsional Fatigue of Turbogroup Shafts Due to Electrical Disturbances — Part II: Determination of Shaft Fatigue.- 14. Estimation and Measurement of Torque Vibrations in Synchronous Machines.- 15. CAE-Techniques for Calculating Natural Frequencies of Machine Stators.- 16. Development of Parasitic Torques Leading to Shaft Vibrations in Induction Motors.- 17. Scale Aspects of Electromagnetic Noise Emission by Cage Induction Machines.- 18. Results of Computer Simulation of Subsynchronous Resonance of Synchronous Generators.- 19. Mechanical and Electromagnetic Vibrations in Salient Poles Hydrogenerators.- 20. How to Avoid Torque Vibrations at Low Speed in Inverter Fed Machines.- 21. Measurements of Vibrations for Electrical Machines.- 22. A Test Rig for Measurement of Vibrations of Electrical Rotating Machines.- 23. Effects of Voltage/Current Harmonics on Noise Emission from Induction Motors.- 24. About the Multiples of Netfrequency in the Noise of Small Asynchronous Machines.- 25. Effects of Rotor Cage Asymmetry on the Performance of Three-Phase Induction Motors.- 26. Vibration Behaviour of Stators of Electrical Machines.- 27. 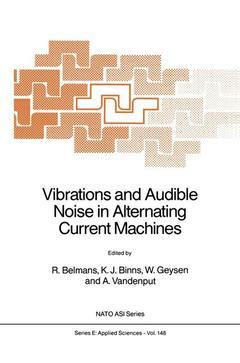 The Electro-Mechanical Torsional Vibration Behaviour of A.C. Machines and Drives.- 28. On-Line Diagnostics of Large Induction Motors.